Pac-12 opener carries College Football Playoff stakes for the Huskies — and, conceivably, Utah. 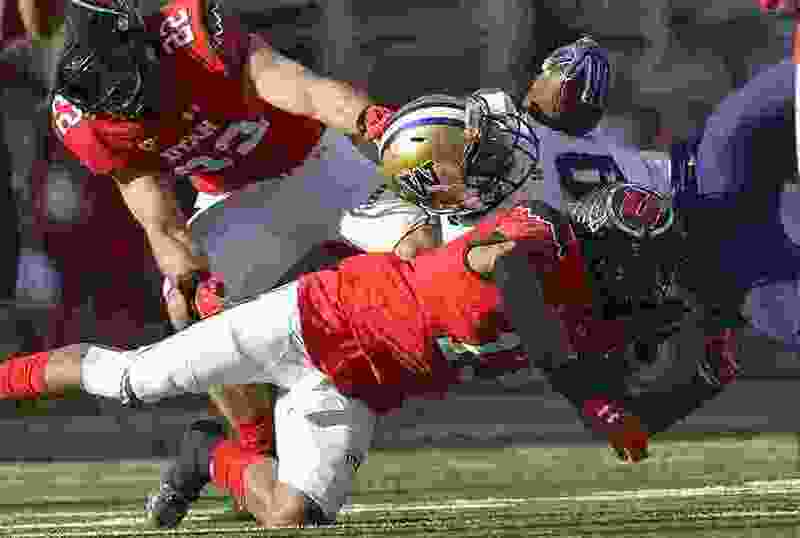 Leah Hogsten | The Salt Lake Tribune Washington Huskies running back Myles Gaskin (9) is brought down by Utes defensive back Jordan Fogal (13). University of Washington Huskies defeated University of Utah Utes 31-24 at Rice-Eccles Stadium, Saturday, October 29, 2016. The convergence that created the biggest September game in Utah's history required BYU's football independence, Troy Taylor's tutoring of a preteen quarterback and Chris Petersen's move to a Power Five program. Utah’s meeting with No. 10 Washington in a “Blackout” promotion Saturday night at Rice-Eccles Stadium is about a 10-year production, arriving early in the 2018 season. The Huskies are the highest-ranked team ever to visit Utah prior to October, and a season-opening loss to Auburn potentially makes this one of a few critical games in Washington’s bid to make the College Football Playoff. To stay in that race, “They'll have to win in a tough environment,” ESPN's Kirk Herbstreit said. For the Utes, this is an opportunity to answer some questions after easing into the schedule and creating more doubt about their offense. Even after an unsatisfying, 17-6 victory at Northern Illinois last weekend, Utah remains a strong contender for the Pac-12 South title. The way the math works, if they want to win the South, the Utes will have to beat one or more good teams from the North: Washington, Washington State, Stanford and Oregon. They'll start their Pac-12 schedule by biting off a lot. Washington is “as complete a team as there is in the country, in my opinion,” Ute coach Kyle Whittingham said. The Huskies are here in mid-September because of BYU’s flexibility and the Pac-12′s unbalanced schedule of Thanksgiving weekend, with USC playing Notre Dame. Another school must play a nonconference game (or have a bye). This year, that’s Utah, facing BYU in November for the first time in the school’s Pac-12 era. Washington quarterback Jake Browning has helped deliver two fourth-quarter wins over Utah, including a 10-point burst in the last minute of a 33-30 victory last November in Seattle. The Huskies' comeback spoiled a career night for Ute quarterback Tyler Huntley, coached by Taylor. Utah’s second-year offensive coordinator personally trained a young Browning – then “a little guy with a big head,” Taylor joked – in northern California and became his coach in the highly successful Folsom High School program. Our home field advantage is only as good as you. If Utah vs. UW is another Troy Taylor Bowl, it also is a career highlight for Tony McGeary, with the distinction of having coached two stars at two high schools in Utah County. Utah linebacker Chase Hansen quarterbacked McGeary’s Lone Peak team to a Class 5A state championship and Washington receiver Ty Jones played for McGeary at Provo. Hansen received a national defensive award for his performance at Northern Illinois and Jones has emerged as a Husky sophomore with seven catches for 153 yards in two games, including a couple of spectacular grabs. In his fifth year at Washington after a phenomenal run at Boise State, Petersen is making the Huskies a national power. That's not surprising to Whittingham, who's a collective 4-1 against big-time coaches Nick Saban of Alabama, Jim Harbaugh of Michigan and David Shaw of Stanford and 1-4 against Petersen. Petersen’s Boise State team beat Utah 36-3 in 2006 and won 26-3 in the 2010 Las Vegas Bowl, but his three meetings with Utah as Washington’s coach have gone deep into the fourth quarter before being decided. Saturday’s game should be another 60-minute battle. The underdog Utes hope so, anyway. Records • Washington 1-1 (0-0 Pac-12); Utah 2-0 (0-0 Pac-12). Series history • Washington leads, 10-1. Last meeting • Washington 33, Utah 30 (2017). About the Huskies • The Pac-12 Networks will stage a pregame show from the Utah campus at 11 a.m. MDT. ... Petersen is 38-18 with the Huskies after going 92-12 in eight seasons at Boise State. … Washington is averaging 515 total yards against two extremes of opponents, Auburn and North Dakota. … Athlon Sports ranked UW’s secondary No. 1 nationally in the preseason. About the Utes • In two games, Utah’s defense has not allowed a play of longer than 19 yards or a touchdown drive of longer than 2 yards. … Tyler Huntley accounted for 341 total yards and three touchdowns in last year’s loss at Washington. Raelon Singleton caught two TD passes; he later transferred to Houston. … Viewers should expect a delayed kickoff or an alternate ESPN platform to begin the game, because the Alabama-Mississippi game starts at 5 p.m. MDT on ESPN.
.@UW_Football and @Utah_Football begin conference play in Ute territory this weekend.